Immediately following his time in Montreal, Gerald began his doctoral studies at the University of Toronto’s department of political science. Building on his work as a Sauvé Scholar, his doctoral research examines the notion that the personalization of power and (neo) patrimonialism hinder the socio-economic transformation of sub-Saharan Africa. His analysis takes Uganda and Rwanda as case studies. Born in a rural area of western Uganda, Gerald’s early exposure to human rights violations and social injustice motivated him to pursue a career devoted to promoting the rights and freedoms of those who cannot speak for themselves. He has demonstrated that he is not afraid to take risks or put his life on the line to expand freedom and rights for the voiceless. Gerald’s earliest interest in democracy and governance came from reading about Mohamed Amin, the Kenyan photographer who helped expose some of Africa’s worst crises in Drum, a cultural magazine that his father often carried home. 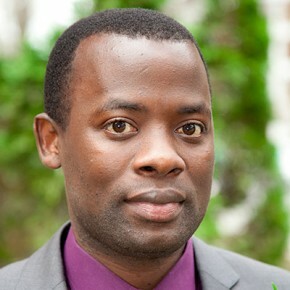 Gerald spent much of his early career working as an investigative journalist with The Daily Monitor, Uganda’s only independent daily newspaper. He has broken some of the most intriguing corruption scandals in Uganda’s history. His 2009 investigation forced Parliament to order the President to refund state funds he had illegally used during the 2001 presidential election. During the hotly contested 2011 Presidential election in Uganda, Gerald investigated and exposed a corruption scandal involving members of the country’s first family. His investigation implicated two of the President’s sons-in-law in an attempt to bribe key opposition figures from the oil-rich Bunyoro region. This scandal involved a 1.5 billion Ugandan shillings payoff. His reporting dominated local and international media throughout the country’s 2011 presidential election. Gerald’s work has been featured on the African Centre for Media Excellency, Aljazeera, the Basel Institute on Governance (Switzerland), The Daily Monitor, The East African, the Institute for Media and Global Governance (Switzerland), The National Post (Canada), Voice of America, and the World Bank Institute. In 2009, Gerald was recognized as one of the best journalists in Uganda for leading an investigation that resulted in a 14-year jail sentence for a senior military officer who had killed two opposition activists and maimed two others. His reporting on human rights and governance was recognized at the 2009 Ugandan Investigative Journalism Awards, hosted by Makerere University’s Department of Mass Communication. His reporting has also been recognized by the World Journalism Institute and by the U.S. National Association of Black Journalists. In acknowledgement of his determined effort to promote human rights and good governance, the World Bank Institute named Gerald one of the top ten young anti-corruption activists in the world for the year 2010. Consequently, he was selected to engage youth in the formulation of the Global Youth Anti-Corruption Campaign (GYAC). Through that campaign, he inspired youth to lobby for access to information and legislation, helped them to formulate anti-corruption awareness-raising campaigns and trained them in new methods to conduct diagnostic governance assessments. Since its launch in 2010, the campaign has provided its 45 member countries with support for capacity and knowledge building in various governance areas, and for using ICT tools to drive government reform. In this way, it has opened doors for a broader conversation on how young people can support better governance in their countries. Gerald holds a bachelor’s degree in journalism and communication with a major in political science (Makerere University), a master’s degree in international relations and diplomatic studies (Makerere University), and an advanced master’s degree in governance and development (University of Antwerp). Gerald examined in greater depth some of the same issues he had been covering as a journalist for years. Under the guidance of his academic mentor, Professor Christopher Manfredi, McGill University’s Dean of Arts and a professor in the department of political science, Gerald investigated the mechanisms that strengthen government institutions, such as the parliament and the judiciary. On 22 March 2013, he presented the culmination of his Sauvé research: a report entitled “The State of Democracy in Uganda: Charting a Path from Strongman Politics to Strong Institutions” as a public lecture at McGill University. While a Sauvé Fellow, Gerald’s academic research on the civil war in northern Uganda and eastern Democratic Republic of Congo was published in the Annuaire des grands lacs, a peer-reviewed French Journal. Over the course of the year, he was also invited to the home of Canada’s Governor General at Rideau Hall to speak with diplomats and policy-makers about the need for education partnerships between Canada and Africa. He joined a panel that considered the opportunities and challenges of enhancing cooperation between African and Canadian universities, and what it is that these institutions – and students – can learn from one another. On behalf of his cohort of Sauvé Fellows, Gerald also delivered a statement of solidarity at the Truth and Reconciliation Commission of Canada’s hearings in Montreal in April. Gerald compared the injustices brought about by Canada’s Residential School System to the ongoing intolerable civil wars, torture, genocide, and other horrific acts of repression and oppression perpetrated by governments and other armed groups in his home region of Sub-Saharan Africa and around the world. In the same month, Gerald spoke about the role of the media and city society in promoting positive change at the gathering of the Garnet Key Society at Concordia University, Montreal, Canada. While in residence, Gerald’s Op-Ed on anti-gay legislation in Uganda, co-written with Sauvé Senior Fellow Brett House was published in The National Post, 30 November 2012. Gerald also particularly enjoyed the encounters that he and his other Fellows had with a number of top policy makers from Canada and around the world including H.E David Johnston (Governor General of Canada) Rosalie Abella (Canada Supreme Court Justice), Kevin Page (Canada’s first Parliamentary Budget Officer), Justin Trudeau (Liberal Party Leader), Thomas Mulcair (Leader of the Official Opposition in Canada, NDP) and Elizabeth May (Green Party Leader). Gerald was one of five participants in the panel discussion following the 2014 Annual Jeanne Sauvé Address by Céline Galipeau. The mentoring and guidance I received during the course of my Sauvé year has served to deepen my commitment and struggle for the development of human rights and democracy in my country (Uganda) and Sub-Saharan Africa in general.